Despite the state of the world and how tense everything has been in a more global sense, 2018 was a very good year for me. Even before my son Maxwell was born in 2017 I had begun to take a hiatus from painting to concentrate more on photography, and after Maxwell was born I took a six month hiatus from creating artwork all together more or less. After Maxwell's first birthday I began to shift my focus yet again. In order to spend more time with him I began to concentrate less on commercial photography, and refocus myself to being a dad and also painting, which is something I can do during spare moments and at home, instead of spending a lot of valuable weekend time travelling to shoot. I always feel a little guilty having so many interests and shifting gears so often, but this was definitely the right move. In late spring I was commissioned to complete a painting of the Newburyport Public Library by the library staff, as a gift to their director who would be retiring in August. This project really got me back into the swing of painting. I had a wonderful summer spent traveling the back roads of New England with Max and Holly and by the end of it I felt recharged and refreshed, ready to go back to school, and ready to get back to painting. During labor day weekend I experienced a major burst of inspiration from photographs I had taken the previous winter, and began creating a series of landscape paintings, which are looser and certainly more relaxing to paint that architecture. The Columbia Gas emergency certainly caused my painting frenzy to derail, but I'd managed to create several solid paintings, and I was happy with the results. Two of those paintings, "Marshland Grove" and "Impressions In Snow" went into the Newburyport Art Association's Fall Members Juried Show, juried by Karen Tusinski of Rockport, where the latter won best oil painting in show, a very nice surprise. Two others, "Frozen Flood" and "Impressions In Snow No. 2" were exhibited in a group show called "Andover" at the Fenn School, in Concord, Massachusetts. 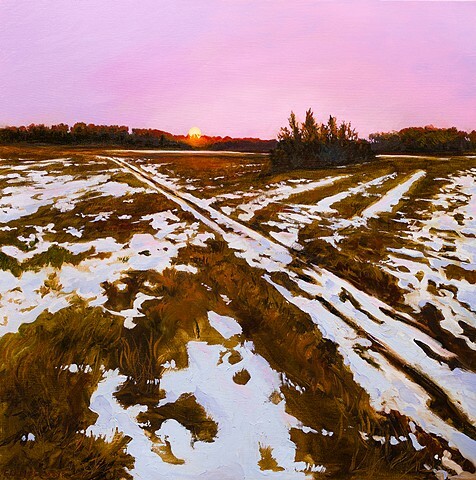 "Andover" was curated by my friend and former educator Jonathan Wachs, who now teaches at Fenn, and featured works in a variety of media created by artists who he met during his tenure at Andover Public Schools. The week before Thanksgiving after seven weeks without gas (no heat, no hot water, no stove) our service was restored and we were able to move home. Then the holiday insanity carried us into the new year, and here we are! I find myself struggling to get back into the mood to paint as regularly as I was in the fall, but my teaching life has been pretty hectic, and winter can be difficult. Thankfully next week I will be on vacation and hopefully will be able to rest up and muster some artful steam.